“I will try to the best of my abilities to serve this temple and to continue to instill a sense of community at TNT, and beyond,” said Rabbi Perlman, during the ceremony. 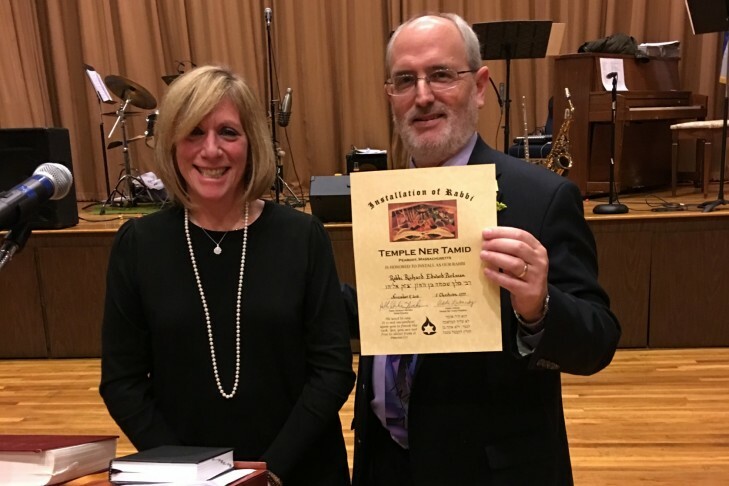 Temple Ner Tamid (TNT) of Peabody recently celebrated the installation of Rabbi Richard Perlman. Generations of temple and community members gathered together for a night of honor and dancing to officially welcome Rabbi Perlman and his wife Kit to the community. The evening was filled with moments of reflection, joy and laughter as Peabody’s Mayor Edward A. Bettencourt, Jr. brought greetings from the city. Rabbi Abraham Morhaim, Rabbi Emeritus served as the Installing Officer. TNT’s Cantor Steve Abramowitz joined Rabbi Morhaim in blessing the new rabbi. Rabbi Perlman’s brother, Cantor Emanuel Perlman, Hazzan at Chizuk Amuno Congregation in Baltimore, MD, also paid tribute to his brother by delivering a beautiful message in word and song. The night began with a meaningful Havdalah service followed by an evening filled with delicious food, dancing and schmoozing. Rabbi Perlman honored Rabbi Morhaim, TNT’s president Adele Lubarsky, and past president Eric Richman, by promising to them, the officers, the board of directors and members of the congregation that he would do all that he can do through his service, to maintain the high standards that the temple enjoys in the community. Rabbi Perlman is looking forward to building bridges within the community, working together with synagogues, churches and people of all faith around the North Shore. “Rabbi David Kudan and I are already working together in a positive mutual friendship and partnership to enhance relationships of ‘Klal Yisrael’- the whole of Israel- and beyond,” Rabbi Perlman said. Rabbi Kudan, of Temple Tiferet Shalom in Peabody, also attended the celebration. Although Rabbi Perlman has been at Ner Tamid only since September, he has made a mark in our Temple community, said Adele Lubarsky.